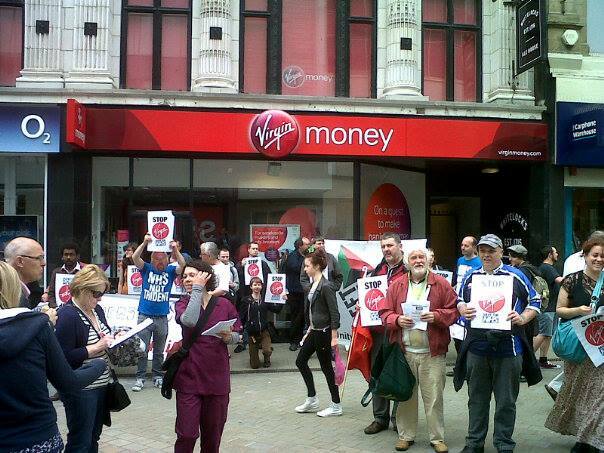 Yorkshire red youth helped out at the Leeds Keep Our NHS Public over the weekend and a fantastic demonstration was held outside Virgin media (just one of the companies looking to benefit from the privatisation of the NHS). Further demonstrations will be taking place this coming weekend and the national conference is in London on 13 July. Check out http://www.keepournhspublic.com and be sure to support the campaigns! Those who attempt to defend the last Labour government’s record on the NHS typically point to the increase in funding from 1999. But while some of that money did go to frontline care, this actually occurred only as an accidental and temporary trickle-down side effect of the real policies driving increased spending at that time: the likes of the Private Finance Initiative (PFI) that sought easy profit opportunities for big business by mortgaging NHS assets to private banking consortia. While the huge increase in public funding for the NHS (from £49bn in 1999/2000 to £119bn in 2009/10) that this covert privatisation process entailed was temporarily sustainable during the last decade’s cheap credit boom, the capitalist economy’s catastrophic tailspin into global recession means this is quite clearly no longer the case. This is the rationale behind the ongoing so-called ‘Nicholson Challenge’ for the NHS to make £20bn-worth of cuts in ‘efficiency savings’ by 2015. And let us remember that this target of £20bn was announced to leading NHS doctors before the ConDem government was elected – ie, by the last Labour government. If decency and common sense governed political decisions in Britain, these savings and more could easily be made by targeting the obvious source of the gross inefficiency that has caused NHS spending to spiral out of control in the first place: ie, by cancelling PFI debt and removing all private-sector involvement in the running of the NHS. But capitalism does not quite work that way; and so wards and whole hospitals are closed and clinical staff thrown out of work so that corporate interests can continue to profit out of the NHS. The media spin that persists in its weasel attempts to invert this reality, blaming spiralling NHS spending on an ageing population, or rising patient expectations, or the mythical ‘inherent inefficiency of the public sector’ should fool no-one. The US healthcare system is entirely privately-owned, and is the most expensive and inefficient in the developed world, costing $6,719 per person per year while leaving 50+ million Americans uninsured and millions more seriously underinsured. In stark contrast, socialist Cuba’s health system, entirely publicly-owned, is able to provide free comprehensive health care for all at a cost of only $362 per person per year, achieving population health statistics rivalling and even surpassing those of developed countries. The difference? At no point in the Cuban system is there anybody who is driving up costs by making a profit. Moreover, the fact that the state is the sole provider of health care avoids the obscenely wasteful duplication, cherry-picking, and poor coordination of services that inevitably arise when multiple inter-competing private providers are involved. Though Cuba’s healthcare achievements are relatively well-known these days, it is less widely recognised that the inspiration for the Cuban system was that of the Soviet Union; still less that the Soviet system – as the world’s first free universal healthcare system – also served as the model for Britain’s NHS itself. Though Labour are invariably credited as the benefactors of the NHS, the fact is that the NHS was effectively a concession made by British capitalism due to the relative strength of the working class in the aftermath of the triumph of Soviet socialism in the second world war. Many things have changed since then. The collapse of the USSR has meant that British capitalism no longer feels compelled to make such concessions to workers to deter them from revolution. Moreover, the profits from reconstruction of industry that fuelled the post-war boom have long since dried up, with capitalists increasingly turning to the option of easy taxpayer-funded bonanzas arising from the privatisation of public services: utilities, railways, education … and the NHS. Since the end of the post-war boom, Labour governments have been just as complicit as the Tories in the slow liquidation of the NHS. It was the Callaghan administration of 1976-79 that began the process of hospital closures, while the Blair government not only kept the Tories’ internal market but further accelerated NHS privatisation by transforming NHS Trusts into ‘Foundation’ Trusts – embryonic private hospitals. The lesson of history is clear: the problem is not merely the HASC Bill and subsequent regulations, to be resolved simply by getting rid of Lansley, Hunt or Cameron, or – God forbid – by voting Labour at the next election, but the whole rotten capitalist system, which, in its insatiable desire for profit, will continue its merciless attack on the living standards of working-class people until it itself is overthrown. Join us now and help us make it happen!